2. Add in peanuts, soy sauce, hoisin sauce, fish sauce and coconut milk and turn heat up to medium-high. 3. 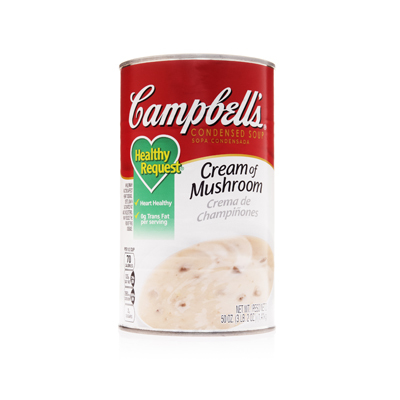 When mixture is warm, add Campbell’s Healthy Request Cream of Mushroom Condensed Soup and water. Bring to a boil then reduce heat to a simmer for 10 minutes. dry roasted unsalted peanuts, lightly crushed	 1 qt. 5. Add remaining peanuts and serve warm. dry roasted unsalted peanuts	 1 qt. 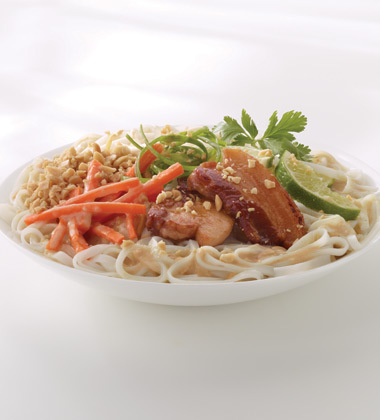 May use fresh lemongrass instead of lemongrass paste; simply dice and put it in cheesecloth. Remove before blending. Add heat with cayenne pepper, chipotle, or a diced jalapenos.